Ed Edmundson has never set foot on a battlefield, but he's felt the cost of war. Sarah Wade hasn't served a day in the military, but in the face of daunting challenges, she's shown a warrior's steely resolve, taking care of her husband, Sgt. Ted Wade. "Sometimes it felt like Ted and I against the world," she said. Sarah is caregiver -- one of the many men and women who quietly care for family members who've been injured in the line of duty. Wade's husband was injured on Valentine's Day in 2004. He lost his right arm and sustained a traumatic brain injury, so she quit her job and dropped out of college to serve -- unpaid -- as his primary caregiver ever since. "I've definitely gone through many times where I've laid awake at night, wondering how in the world we were going to make it," she said. Ed Edmundson, too, has never set foot on a battlefield, but he's felt the cost of war. Edmundson, the father of Sgt. Eric Edmundson, described himself as "burned out, physically and mentally." "No one can care for an injured soldier better than those that love them and know them and care for them," he said. "No one can." Military doctors initially offered little hope for Eric Edmundson, and Veterans Affairs recommended a nursing home. But instead, his father fought to get his son into private rehab in Chicago. Six months later, with some help, Eric Edmundson was able to walk out of the facility, into the arms of his wife and daughter. "We came very close to losing Eric," recalled his father, with tears in his eyes. "We felt very blessed to have him home." But Edmundson'sdedication to his son has taken an enormous toll. He left his job, lost his health insurance and cashed in his retirement savings. "Last year, I had pneumonia, and I couldn't go to the doctor because I couldn't afford to go," Edmundson said. For Ed Edmundson, Sarah Wade and thousands of others like them who have provided loving care for an injured soldier, a new law, signed by President Obama in May offers some hope by providing a stipend, health insurance and counseling to family members who give up so much to provide care to their loved ones. Sarah and Ted Wade were at the White House to watch the president sign the bill into law. "As Sarah can tell you, it is hard physically, it's hard emotionally," said Obama. "And these tireless caregivers shouldn't have to do it alone." 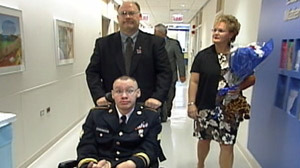 The soldiers' brave caregivers are now finally getting some support and recognition of their sacrifice.